This article is about SERE in the United States. For a similar course in the United Kingdom, see Survive, Evade, Resist, Extract. It has been suggested that Survive, Evade, Resist, Extract be merged into this article. (Discuss) Proposed since August 2012. Survival, Evasion, Resistance, and Escape (SERE) is a program, best known by its military acronym, that provides U.S. military personnel, U.S. Department of Defense civilians and private military contractors with training in evading capture, survival skills and the military code of conduct. Established by the United States Air Force at the end of the Korean War (1950–53), it was extended during the Vietnam War (1959–1975) to the U.S. Army, U.S. Navy and U.S. Marine Corps. Most higher level SERE students are military aircrew and special operations personnel considered to be at high risk of capture. The U.S. Air Force SERE School is located at Fairchild AFB, Washington, while SERE Training for the U.S. Army is located at Fort Bragg, North Carolina and at Fort Rucker, Alabama. The Navy and Marine Corps SERE School has known locations at: the U.S. Navy Remote Training Site at Warner Springs, California the remote Marine Corps Mt. Warfare Training Center (Bridgeport CA) Portsmouth Naval Shipyard in Kittery, Maine. 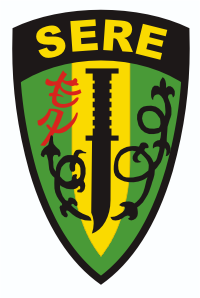 The depicted SERE patch is said to have the following symbolic significance: the color green represents freedom; the patch is halved with a yellow strip to signify that survival, evasion, resistance and escape all require caution, with the knife the basic survival tool; the severed barbed wire represents captivity but freedom regained; the word tiger in Chinese (虎) alludes to the Here be dragons/tigers legend found on early maps; finally, the black surround honors symbolically those who have died on active duty. The curriculum has three key parts: survival and evasion; resistance and escape; and water survival; some parts are classified. Most of SERE training focuses on survival and evasion. Skills taught include woodcraft and wilderness survival in all types of climate. This includes what is known as emergency first aid, a variant of the battlefield variety, land navigation, camouflage techniques, methods of evasion, communication protocols, and how to make improvised tools. Training on how to survive and resist the enemy in the event of capture is largely based on the experiences of past US and allied prisoners of war. How to survive in water is taught at a separate Professional Military Education (PME) course; it takes three days and is typically attended after the main SERE course. In addition to training in the use of aquatic survival gear, more academic skills include first aid tailored to an aquatic environment, communication protocols, ocean ecology, and equipment maintenance. If I am captured, I will continue to resist by all means available. I will make every effort to escape and to aid others to escape. I will accept neither parole nor special favors from the enemy. If I become a prisoner of war, I will keep faith with my fellow prisoners. I will give no information nor take part in any action which might be harmful to my comrades. If I am senior I will take command. If not, I will obey the lawful orders of those appointed over me and will back them up in every way. When questioned, should I become a prisoner of war, I am required to give name, rank, service number, and date of birth. I will evade answering further questions to the utmost of my ability, I will make no oral or written statements disloyal to my country and its allies or harmful to their cause. Level A: Entry level training. These are the Code of Conduct mandatory classes taken by all at induction (recruit training and OCS). All service personnel get this basic training annually. Level B: For those operating or expected to operate forward of the division rear boundary and up to the forward line of own troops (FLOT). Normally limited to aircrew of the Army, Air Force, Navy and Marine Corps. Level B focuses on survival and evasion, with resistance in terms of initial capture. Level C: For troops at a high risk of capture and whose position, rank or seniority make them vulnerable to greater than average exploitation efforts by any captor. Level C focuses on resistance in terms of prison camps. SERE training is included in the flight school curriculum at Fort Rucker, Alabama for all Army Flight crews, both commissioned officers and warrant officers. It is the full course of 21 days. There is also a school at Camp Mackall for candidates in the Special Forces pipeline. The primary Air Force SERE training center is at Fairchild Air Force Base, Washington; training for Level "B" medical aircrew was conducted at Brooks City-Base, Texas until the planned course closure 30 September 2009. The Air Force conducts arctic survival training at Eielson Air Force Base, Alaska, and parachute water survival training at Naval Air Station Pensacola, Florida. SERE training was also conducted at the US Air Force Academy in Colorado Springs from the late 1960s until 1995, enabling those USAF officers commissioned through USAFA to exempt USAF SERE training at Fairchild AFB following undergraduate pilot or navigator training. In contrast, those USAF officers commissioned through AFROTC or OTS still had to complete SERE at Fairchild following flight training. In 1995, the resistance/escape element of the course at USAFA was abolished (see Controversies below), leaving the survival and evasion classes in a program called Combat Survival Training (CST). The academy discontinued CST entirely in 2005, but has more recently announced the reinstatement of the program, including some portions of resistance training, in summer 2008. Now, all USAFA graduates selected for pilot, air battle manager, or navigator training must complete SERE training at Fairchild after receiving their wings, along with their AFROTC and OTS graduate counterparts. Level A is taught to recruits and candidates in Officer Candidate School and the Recruit Depots, or under professional military education. Level B at the Marine Corps Mountain Warfare Training Center, Bridgeport, California, and at the North Training Area, Camp Gonsalves, Okinawa Prefecture, Japan. Level C is held at Portsmouth Naval Shipyard, Kittery, Maine at the Navy Remote Training Site, Rangeley, and at Naval Air Station North Island, California at the Navy Remote Training Site, Warner Springs. This installation provides 'Code of Conduct' that is necessary for Recon Marines, Marine Corps Scout Snipers, MARSOC Marines, Navy SEALs, enlisted Navy and Marine Aircrewman, Naval Aviators, Naval Flight Officers, Naval Flight Surgeons, and Navy SWCC. As the "eyes" and "ears" of the commander, they carry knowledge of sensitive battlefield information. The training encompasses those basic skills necessary for worldwide survival, facilitating search and rescue efforts, evading capture by hostile forces. It is based on and reinforces the values expressed in the Code of Conduct while maintaining an appropriate balance of sound educational methodology and realistic/stressful training scenarios. Additional survival training in Level C Code of Conduct may include the five-day Peacetime Detention and Hostage Survival (PDAHS) course. This training provides the skills to survive captivity by a hostile government or terrorist cell during peacetime. The SERE techniques are commonly, but erroneously, believed to be modeled on abusive Chinese "brainwashing" practiced on U.S. POW's during the Korean War, to extract false confessions. Instead, most SERE techniques were modeled after 1950's and early 1960s CIA interrogation and psychological warfare practices. The CIA physical and psychological methods were originally codified in the Kubark Counterintelligence Interrogation Manual published in 1963, and in CIA torture training handbooks for Latin American regimes published in the 1970s and 1980s, and were employed during the Cold War, the CIA's Phoenix program in Vietnam, and the CIA's Operation Condor in South America. The other primary source for SERE techniques was 1960's CIA "mind control experiments," using sleep deprivation, drugs, electric shock, and isolation and extended sensory deprivation. Certain of the less physically damaging CIA methods derived from what was at the time called 'defensive' behavioral research" were reduced and refined as training techniques for the SERE program. One of the U.S. Air Force's SERE training programs was conducted at the United States Air Force Academy from the late 1960s until 1995. Because a large number of pilots and other aircrew members graduated from the academy, it was more efficient for the Air Force to send all cadets through SERE training while they were still at the academy. Cadets would normally complete the training during the summer between their fourth-class (freshman) and third-class (sophomore) years. A number of selected second-class (junior) and first-class (senior) cadets would serve each year as SERE training cadre under the supervision of enlisted Air Force SERE instructors. As a result of POWs' experiences during Operation Desert Storm, sexual assault resistance was added to the SERE curriculum. However, some of the training scenarios allegedly were taken too far by SERE cadet members at the academy during practical portions of the program. In 1995, the ABC television news program 20/20 reported that as many as 24 male and female cadets in 1993 had allegedly been sexually assaulted at the Academy during SERE training. One of the cadets sued the U.S. federal government, which eventually settled for a reported $3 million in damages. As a result of the scandal, the SERE program at the Academy was reduced to the survival and evasion portions only, and the curriculum was revamped to be in line with the main course at Fairchild AFB titled: "Combat Survival Training (CST)". All graduates going on to aircrew positions were then required to attend the resistance portion of the training at Fairchild Air Force Base before reporting to an operational flying unit. The CST program was discontinued entirely in 2004. The Air Force Academy SERE program is running as of summer of 2008. The curriculum of the revived program will contain some resistance elements, but will not contain sexual assault resistance. In July 2005 an article in The New Yorker magazine alleged that psychologists who help direct the SERE curriculum have been advising the military at Guantanamo Bay detainment camp and other sites on interrogation techniques. The SERE program's chief psychologist, Colonel Morgan Banks, issued guidance in early 2003 for the "behavioral science consultants" who helped to devise Guantánamo's interrogation strategy although he has emphatically denied that he had advocated the use of counter-resistance techniques used by SERE instructors to break down detainees. The New Yorker notes that in November 2001, Banks was detailed to Afghanistan, where he spent four months at Bagram Air Base, "supporting combat operations against Al Qaeda and Taliban fighters". In June 2006 an article on Salon.com, an online magazine, confirmed finding a document obtained by the American Civil Liberties Union through the Freedom of Information Act. A March 22, 2005, sworn statement by the former chief of the Interrogation Control Element at Guantánamo said SERE instructors taught their methods to interrogators of the prisoners in Cuba. The article also claims that physical and mental techniques used against some detainees at Abu Ghraib are similar to the ones SERE students are taught to resist. According to Human Rights First, the interrogation that lead to the death of Iraqi Major General Abed Hamed Mowhoush involved the use of techniques used in SERE training. According to the organization "Internal FBI memos and press reports have pointed to SERE training as the basis for some of the harshest techniques authorized for use on detainees by the Pentagon in 2002 and 2003." On June 17, 2008, Mark Mazzetti of The New York Times reported that the senior Pentagon lawyer Mark Schiffrin requested information in 2002 from the leaders of the Air Force's captivity-resistance program, referring to one based in Fort Belvoir, Virginia. The information was later used on prisoners in military custody. In written testimony to the Senate Armed Forces Committee hearing, Col. Steven Kleinman of the Joint Personnel Recovery Agency said that a team of trainers that he was leading in Iraq were asked to demonstrate SERE techniques on uncooperative prisoners. He refused, but his decision was overruled. He was quoted as saying "When presented with the choice of getting smarter or getting tougher, we chose the latter." Secretary of State Condoleezza Rice has acknowledged that the use of the SERE program techniques to conduct interrogations in Iraq was discussed by senior White House officials in 2002 and 2003. ↑ Sherwood, Ben, "Lessons in Survival", Newsweek, February 23, 2009. ↑ 4.0 4.1 Swanson, Perry (12 January 2008). "Hostage Training to Resume for Cadets". The Gazette. Colorado Springs. http://www.gazette.com/articles/training_31846___article.html/cadets_program.html. Retrieved 2008-01-14. ↑ For example, the Senate Armed Services Committee Report on abuse of detainees at Guantanamo, Abu Ghraib, and CIA black site prisons reiterates the popular misconception that SERE techniques originated in Chinese Communist methods in the Korean War employed to extract false confessions from US POW's. Inquiry into the Treatment of Detainees in U.S. Custody, Report of the Committee on Armed Services of the U .S. Senate, November 20, 2008, 110th Cong. 2nd Sess. (U.S. Gov't Printing Office). ↑ A 1956 U.S. Department of the Army report called physical and psychological abuse resulting in brainwashing a "popular misconception;" there was not a single reliable report of brainwashing.U.S. Department of the Army (15 May 1956). Communist Interrogation, Indoctrination, and Exploitation of Prisoners of War. (Pamphlet No. 30-101 ed.). U.S. Gov't Printing Office. pp. 17 & 51. ↑ McCoy, Alfred (2007). A Question of Torture: CIA Interrogation, from the Cold War to the War on Terror. Henry Holt & Co.. pp. 10, 50–51, 71. ISBN 978-0-8050-8248-7. ↑ Mayer, Jane (2005-07-11). "THE EXPERIMENT: The military trains people to withstand interrogation. Are those methods being misused at Guantánamo?". Newyorker.com. http://www.newyorker.com/archive/2005/07/11/050711fa_fact4. Retrieved 2009-04-02. ↑ Benjamin, Mark (2006-06-29). "Torture teachers". Salon.com. http://www.salon.com/news/feature/2006/06/29/torture/index.html. Retrieved 2006-07-19. ↑ Hina Shamsi; Deborah Pearlstein, ed. Command's Responsibility: Detainee Deaths in U.S. Custody in Iraq and Afghanistan: Abed Hamed Mowhoush, Human Rights First, February 2006. Accessed 4 August 2008. ↑ Mark Mazzetti. "Ex-Pentagon Lawyers Face Inquiry on Interrogation Role". The New York Times, June 17, 2008. ↑ Kleinman, Steven. "Officer: Military Demanded Torture Lessons". CBS News, July 25, 2008. David J. Morris (January 29, 2009). "Cancel Water-Boarding 101; The military should close its torture school. I know because I graduated from it". Slate Magazine. http://www.slate.com/id/2210059/.